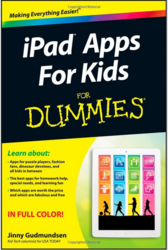 The Language Express® is pleased to announce that its social skills learning program, The Social Express, is included in a new book, iPad Apps For Kids For Dummies, by Jinny Gudmundsen. The book is published by John Wiley & Sons, Inc.
By interacting with friendly characters that kids can easily relate to, players learn how to start conversations, be a part of a group, look for hidden rules in social situations and more. The Language Express®, makers of The Social Express®, is honored to announce that the company’s social skills learning program is included in a new book, iPad Apps For Kids For Dummies. John Wiley & Sons, Inc. recently published the new book, authored by Jinny Gudmundsen. Ms. Gudmundsen is also a columnist at USA Today the Kid-Tech column and Editor-in-Chief for Computing With Kids E-zine. For children who have trouble understanding social situations, The Social Express learning program lets them learn by role-playing through 16 interactive lessons. Presented as video vignettes starring four animated kids, the lessons clearly reveal the characters' facial expressions and body language. The author also featured The Social Express in a Kid-Tech column in USA Today. Click here to read the USA Today Kid-Tech review.